Type Specimen is a digital catalogue for the Suitcase Type Foundry. 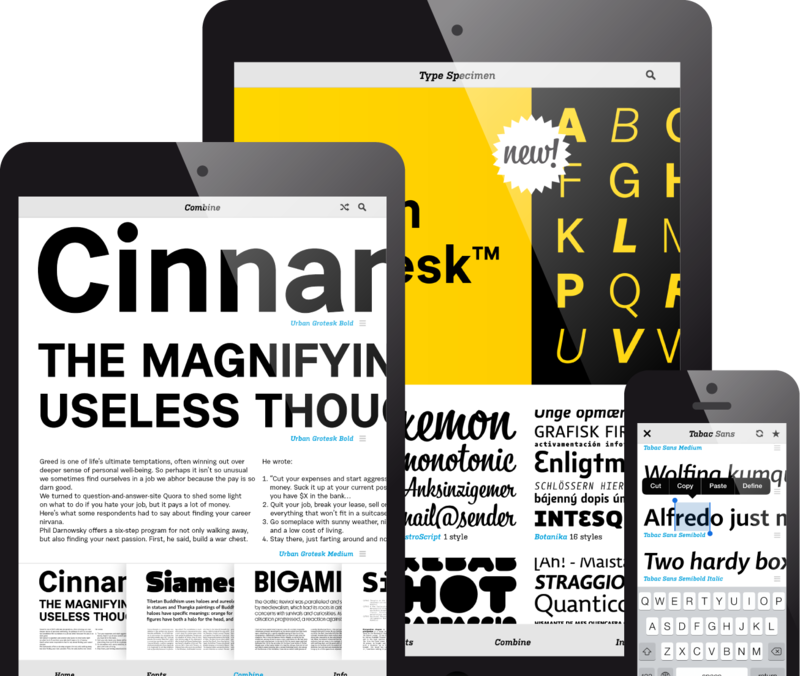 It’s a mobile app that lets you be innovative in your font selection for your design projects. Compared to ordinary paper specimens, it boasts a wealth of interactive functions. Version 2.0 brings you many new features: a completely reworked interface, Retina resolution, support for iPad, iPhone and iPod Touch, a live tester, and an inverse display option. At the same time, it keeps the fundamental ones: it works offline and it’s free. Each font on its own dedicated page represents a sample of the type specimen, and displays an overview of all typefaces, a zoomable preview of all characters in a specific set and detailed information about the origins of the font and its technical details, or about its available OpenType functions. You can also label your fonts as favorite using the star symbol in the toolbar. 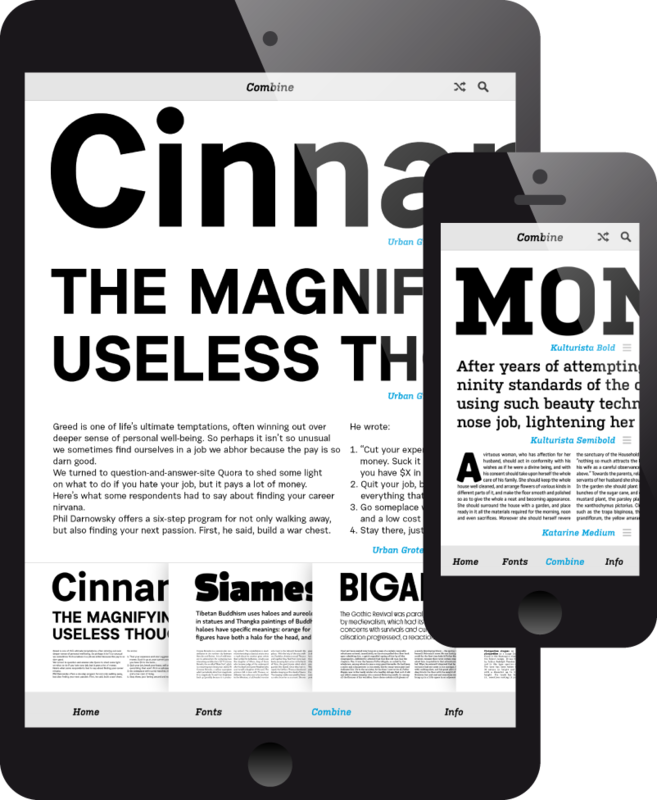 Combine is a groundbreaking tool that lets you quickly find the best combination of headline and body fonts, without having to purchase and install a single font into your computer. Simply browse through the wide range of options. You can also use the Sort button, displayed after a font name, to select Headline, Subhead or Text and to select a specific font. Or you can let yourself be surprised by a random combination using the Shuffle function. We’ve also created several interesting preset combinations for the iPad version. 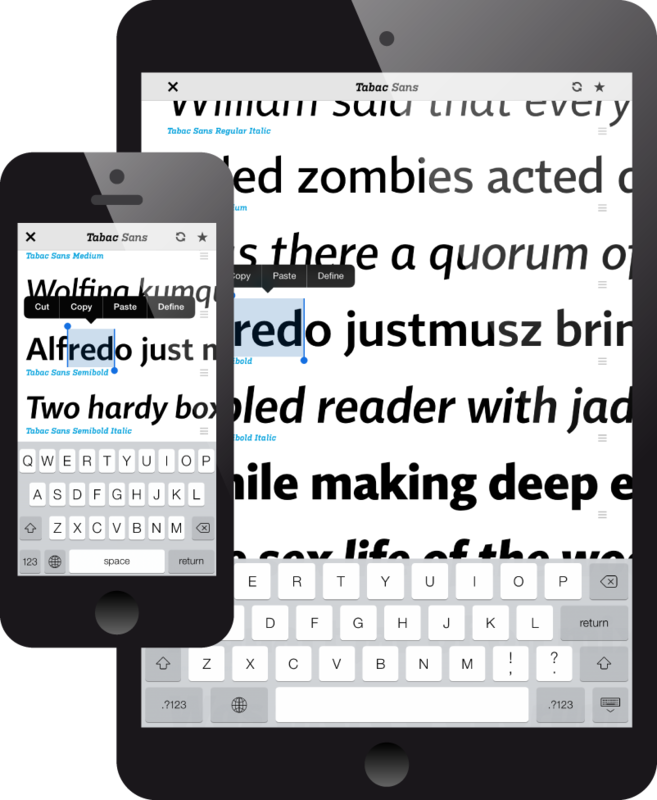 A fundamental new feature is the ability to fully edit the sample texts on the fonts’ pages. Clicking on a text row activates the keyboard, so that you can type in your own text. You can then select any other font using the Sort button, and so compare individual fonts, displayed below each other, using a text sample specific to your needs. The fonts behave like OpenType fonts in the tester, so all Latin accents, kerning and ligatures are available. Over‑combined? Use the Shuffle button to reset everything to the default state. The Info section lets you change the colour options of the app. You can then view all fixed and editable sections on a black background. This is very useful in low light conditions, as a tool to match the screen colour to the colour of your device, or purely to enjoy white letters on a black background. iPad Pro, iPad Air, iPad 2, iPad 3rd gen., iPad 4th gen., iPad Mini, iPad Mini 2nd gen., iPhone 6, iPhone 6S, iPhone 5, iPhone 5C, iPhone 5S, iPhone 4, iPhone 4S, iPod Touch 5th gen.